Home » Climate change » The melting of permafrost, a serious danger ? Climate change might unfreeze these soils, which might be a serious danger as they contain very large quantities of methane, a very potent greenhouse gas. I previously read several articles on this topic and the least one can say is that it might become a serious problem if climate change reached a certain level. 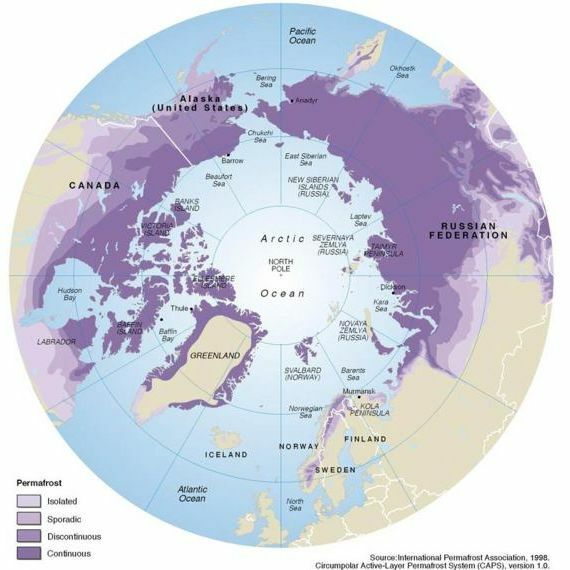 Permafrost zones occupy up to 24 per cent of the exposed land area of the Northern Hemisphere. Permafrost is also common within the vast continental shelves of the Arctic Ocean. This subsea permafrost formed during the last glacial period when global sea levels were more than 100 m lower than at present and the shelves were exposed to very harsh climate conditions. Subsea permafrost is slowly thawing at many locations. Permafrost of various temperatures and continuity also exists in mountainous areas, due to the cold climate at high elevations. Source : Permafrost distribution in the Arctic from UNEP – GRIDA. The United Nations Environment Programme (UNEP) warns against the effects of global warming on permafrost, and recommends conducting more research into understanding the effects. Conclusions from such research should prepare the Arctic population for the dangers ahead as well as dangers they are already facing. Permafrost is a typical characteristic of the Arctic and can be from a few metres to one kilometre deep. Today’s spread of permafrost in the northern hemisphere is shown on the map. The ground in areas with permafrost is normally suitable for building, however scientists at the University of Alaska have found a temperature increase in permafrost from -4 to -1 degree Celsius. Such a warm-up reduces the ability of the ground to support large structures by 70 per cent. So as one can see, climate change affects permafrost, but what if the opposite was true and that permafrost affected climate change ? Permafrost melting releases important quantities of methane, which is 23 more potent a greenhouse gas than carbon dioxide and remains in the atmosphere. The studies done by the United Nations and many other parties are quite scary and should force us even more to mitigate global warming fast. For thousands of years the tundra has worked as a carbon sink, because dead vegetation does not rot but is stored in the ground. Thinning of the permafrost allows micro-organisms to break down the biological material. In this process, methane and carbon dioxide are released. In Alaska it is documented that the tundra has changed from being a carbon stock to becoming a source of carbon to the atmosphere. The carbon is mostly released as methane, because the rotting process is happening in wet soil with little or no supply of oxygen. Water gathering on top of the permafrost will often lead to increased melting, ground erosion, and canals and holes in the ice. Removal of the topsoil leads to further melting of permafrost. These processes contribute to the self-perpetuating mechanism of more releases of carbon dioxide and methane contributing to the greenhouse gas effect. UNEP recommends continuous surveillance of areas with permafrost and the significant damages which the melting can do to infrastructure, ecology, indigenous people and to enhancing greenhouse effect. Here is a scary paragraph that should get more people into action now!